In the 1930s, the Florida Keys became known as a mecca for sportsfishermen from all over the world. Small fishing camps sprang up in the Keys to accommodate these groups of fishermen, who wanted comfortable sleeping quarters, great food, strong drink, camaraderie, and of course, outstanding fishing. The fishermen, guided in their endeavors by locals, breakfasted, fished the morning, then came back into shore for a hearty lunch and a rest before resuming fishing in the afternoon. In the evening, they enjoyed another hearty meal followed by beers, cigars and tall tales from the dayâ€™s adventures. The Conch structure that today houses Ballyhooâ€™s was one of the buildings from an early fishing camp. While many buildings have not survived the ravages of time and storms, Ballyhooâ€™s Dade County Pine structure has been lovingly preserved and restored so that you may enjoy the beamed ceilings and quaint atmosphere while feasting on the best seafood, steaks and sandwiches that the Florida Keys has to offer. 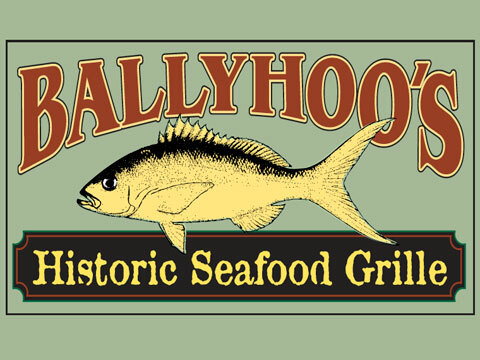 Ballyhooâ€™s menu has evolved from traditional Conch favorites to current ones, and if you pay attention, youâ€™ll overhear some great fishing tales while youâ€™re here!